At The Yorkshire Air Museum, situated in a small room at the foot of the Control Tower, we operate a ‘radio shack’ on licenced amateur radio frequencies. Firstly – to show to museum visitors, working examples of typical equipment used in the period that the museum relates to and the use of morse code. Secondly – to help the museum ‘on the map’ in all parts of this country and abroad – explaining to people where the museum is located and about it’s collection. We are presently operating on a two day per week rota (Wednesdays and Saturdays) However we are here frequently other days when museum activities or interested visitors demand – you will nearly always find us here on the Museum event days. We also participate in various special events such as ‘Museums on the Air Day’ when museums worldwide (all types including aircraft, industrial, railway etc) communicate with one another. Another special day is Marconi Day – a similar event remembering the ’father’ of radio using sites or equipment having a Marconi connection. We pride ourselves in using mainly period restored / rebuilt WW2 equipment. Above all, we avoid relying on the ‘modern black box’! Operation is a mostly either AM (amplitude modulation) or CW (Morse) in the tradition of the wartime wireless operator. We do occasionally operate some SSB (single sideband) equipment to maintain contact to non AM / CW stations – including the RAF Amateur Radio Society who only use SSB. The T1154 transmitter (with coloured knobs) and the R1155 receiver – used on all post early 1941 Bomber Command aircraft such as the Halifax, Lancaster, Stirling etc. We have the full D/F (direction finding) facilities working in the R1155 as used in all Bomber Command aircraft, complete with twin pointer meter and original loop aerial. It is surprising how accurate this equipment is for a technology first patented in 1929! The communication aerial is a 260 foot wire loop supported at three points and is strung from a mast on the control tower. Connection is by 60 foot of open wire feeder enabling the one aerial to work on any frequency. Replica Suitcase Paraset. This is modelled around the Whaddon Mk7 used by SOE in many occupied countries. This fully operational replica was created from reference to one used by the Norwegian Resistance. The original Paraset now resides in the Oslo museum. Drawings and photographs of the original set were obtained and a search initiated for parts. This set has been constructed as near as possible using original 1940s components. The actual suitcase that contains the secret radio is from the 1940s and belonged a 514 Squadron Flight Engineer. This amazing secret radio set proves very popular with visitors to the museum who are fascinated that contacts can be made across the North Sea using only 4 watts of power – less power than a modern household torch! ART13 transmitter and RCA SR88 The American ART13 was used in the B29 Superfortress. The RCA AR88 receiver were not airborne equipment but used in listening stations and control towers. When you visit the radio shack, you will also see three aluminium units above the American radios. These house the three custom built power supplies to run the transmitter from the mains electrical supply. 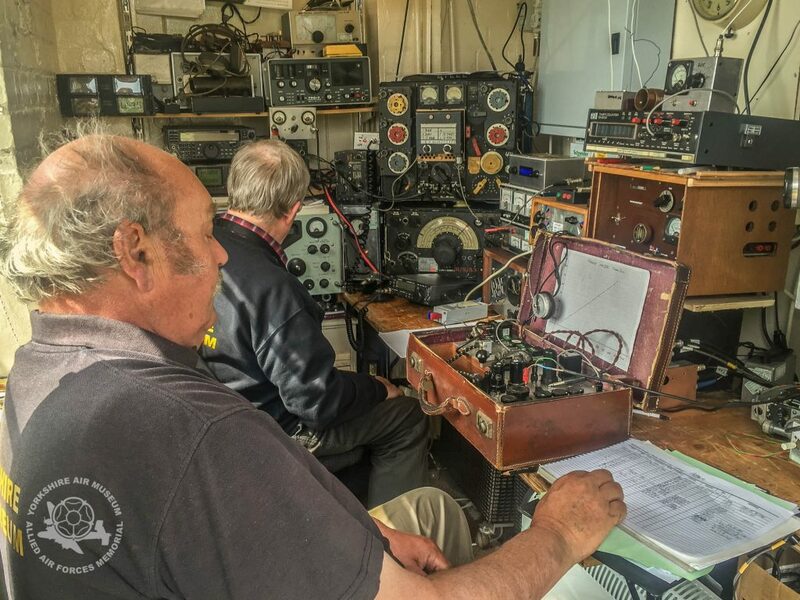 The ‘shack’ is operated by Walter Roberts (own callsign G3GXQ), ex RAF radio mech and who is our chief morse operator, Ken Sanderson (G4KCF) ex electronics lecturer who maintains the equipment and Ian Cutler (G3 ) ex Royal Signals – our radio shack public relations officer. Most contacts we make from our radio room are random, although we do have certain regular contacts such as with the Vintage Military Amateur Radio Society on a Saturday when usually there are some 20 stations on air, all using ex military radio equipment. Some regular maintenance is done on site but major rebuilds usually take place in Kens workshop, the radio room can be tight on space sometimes! Visitors who are licensed are always welcome to ‘operate’ and we have had many ‘G’ (UK) operators and several from abroad. If you’re visiting the Museum and the radio room is on air, be sure to stop by and say hello to the team. They’re always very happy to chat and show visitors more about early radio technology which has evolved into the always on digital world we live in today.